The objectives of this research are to: a) compare project management assessments (PMAs) from four firms across four industry sectors (75 PMAs are evaluated using known statistical techniques); b) validate the results through an expert panel; c) apply Pearson's correlation analysis to find links in the PMA constructs and see how these links relate to the overall project result; and d) identify areas for further research. Three hypotheses are tested, and reveal differences and similarities in project management practices. The results provide interesting opportunities for researchers and for project management practitioners. Finally, a discussion, the limitations of the study, and suggestions for further research are presented. Die doelwitte van hierdie navorsing is eerstens om projekbestuur-assesserings van vier firmas in vier industriesektore te vergelyk (vyf-en-sewentig projekbestuurassesserings is evalueer met bestaande statistiese ontledingstegnieke). Tweedens is die doel om die resultate deur 'n kennerpaneel te valideer en derdens om Pearson se korrelasie analise toe te pas om ooreenstemminge in die projek-bestuurassesserings op te spoor en om te sien hoe hierdie dit verband hou met die algehele projek uitslag. Laastens word areas van verdere navorsing identifiseer. Drie hipotese is getoets en toon ooreenkomste en verskille in projekbestuurpraktyke. Die resultate lewer interessante geleenthede vir navorsers en projekbestuurders. Ten slotte word 'n bespreking, die beperkings van die studie en voorstelle vir verdere navorsing voorgehou. The aim of this research is to make a contribution to knowledge by providing empirical evidence on project management assessments (PMAs). Seventy-five PMAs are used to compare project management practices between four firms and four industry sectors. The research is significant in that it shows that there is a need for an industry-wide project management assessment (PMA) tool that can be used by project management practitioners. The results of the research show similarities and differences between industry sectors. From the four industry sectors it is shown that the electronics and electrical engineering, and information and communication technology (ICT ) industries show significant differences in their means for the overall project result, whereas the services and consulting engineering industries show no significant differences between the means for the overall project result. Comparisons are also drawn between the different PMA constructs. To understand the need for empirical PMA research better, the need for project management needs to be understood better. Given the rapid pace of business evolution, firms are expected to become increasingly competitive. Siriram  states that old ways of doing business are becoming obsolete, and that the rules of the game change at a bewildering rate. Some firms (buyers) expect firms (sellers) to become more competitive than other firms (other suppliers) in the production of goods and services. Siriram  says that firms are in a race to be better, or they are at risk of becoming less competitive. Firms need to develop their capabilities to outsmart other firms. Some firms are project-driven, and in these firms project management is seen as a capability to develop competitive advantage. Grant  sees the firm's capabilities as resources needed to develop competitive advantage, which is necessary to out-smart competitors. It is important that firms that are project-driven see project management as an integral part of their business strategy. Srivannaboon and Milosevic  say that many firms see project management as a building block for strategy, and that aligning project management and strategy may help firms to become more competitive. Therefore, one may see project management as a capability needed for competitive advantage. To develop project management as a capability, researchers such as Fringsdorf, Zuo and Xia  identify critical success factors for project efficiency; they say that these factors need to be developed to ensure successful project outcomes. They add that these factors are not limited to individual project factors, but extend to include project interdependencies and external customers. Maylor, Brady, Cook-Davies and Hodgson  argue that, for the past decade, firms have been changing their competitive strategy from an operational strategy to a project management strategy; more recently, Maylor, Turner and Murray-Webster  show how operational strategies may be adapted in certain cases as project-based operations. Moreover, Thiry and Deguire  speak of project-based firms that can shape or re-shape strategies. Others, such as Canonico and Soderlund , say that more firms are being managed through projects, and that it is difficult to imagine a firm that is not managed through some kind of project activity. This is also shown by Kujala, Artto, Aaltonen and Turkulainen , who point out that business models in project-based firms focus on service delivery and integrated solutions across the project life cycle. In further support of this idea, Wikstroöm, Artto, Kujala and Söderlund  show the diversity in business models for project-based firms. Buys and Stander  highlight the need to link projects to business strategy. On the other hand, Meskendahl  suggests that business strategy describes the way in which a firm opts to compete in the market compared with its competitors. Based on this research evidence, it may be concluded that developing project management as a capability is necessary to drive competitive advantage in project-based firms. Given the need to link business strategy to projects and to competitive advantage, Young, Young, Jordaan and O'Connor. point out deficiencies in the way projects are currently selected and managed, thereby limiting the capability to realise strategic goals. Young and Grant  also found that projects contribute little to strategic goals; other than in some stable environments, projects have made some contribution to strategic goals. Given that project management can shape and reshape a firm's strategies , firms are looking for integrated business models  and the complexity that arises from the diversity of business models , not to mention the deficiencies in project execution . It may be stated that project management is an underdeveloped capability, and more investigation and attention needs to be devoted to project management. To develop project management as a capability, some researchers, such as Andersen and Jessen , see project maturity as important. Golini, Kalchschmidt and Landoni  define project management maturity as a firm's capabilities in relation to the project management process (management of time, scope, quality, etc.). Given the importance of project management maturity, Mittermaier and Steyn  see the need for project management maturity and assessment; and Cao and Hoffman  speak of assessing project performance and evaluation to achieve project management maturity. Grant and Pennypacker  argue that the project management community is actively involved in developing methods to assess and improve project management maturity. Tahri and Drissi-Kaitouni  argue that there is generally no agreed definition of what a mature project organisation looks like, and therefore a growing number of maturity models are being developed to assess project management maturity. Furthermore, Grant and Pennypacker  argue that there is little research evidence supporting empirical research investigating project management assessments. Therefore, based on these observations, it would be beneficial to develop a tool to assess the maturity of project management within organisations. Pennypacker and Grant  point out that assessment tools allow an organisation to assess and compare its own practices against best practices, or against those employed by competitors, with the intention to map out a structured path to improvement. Further support of this is given by Qureshi, Warraich and Hijazi , who argue that good project management assessment tools are required to make organisations the 'best of the best'. Therefore, in this research paper, drawing on empirical research, a project management assessment (PMA) tool is proposed. Clearly, project management is a capability that needs to be further developed. In this paper, research on project management assessments (PMAs) is conducted, as PMAs are the basis for project management maturity. PMA can therefore be defined as a tool that an organisation can use to assess its project management maturity, comparing its own practices against best practices with the intention of mapping out a path to improvement. a) Carrying out empirical research to compare project management practices using 75 project management assessment (PMAs), involving four firms across four industry sectors to obtain a better understanding of the similarities and differences using known statistical techniques. b) Validating the results through an expert panel. c) Using Pearson's correlation analysis to find links in the PMA constructs, and seeing how these links relate to the overall project result. d) Identifying areas for further research. The research draws on the experiences of an expert panel to validate the results of the empirical analysis, and provides important insights for researchers and project management practitioners. Many firms have reported having poor project management results. Miller and Lessard  refer to 60 large-scale projects with an average capital value of US$ 1 billion undertaken between 1980 and 2000; 18 per cent of them incurred extensive cost overruns. They also showed that almost 40 per cent of the projects performed so badly they were totally abandoned or were restricted after experiencing financial crises. Morris and Hough  also provide a comprehensive list of cost overruns on large complex projects (LCPs). In further support, Merrow, McDonnell and Arguden  studied 47 LCPs and found that four finished on budget, with an average cost overrun of 88 per cent, and that 26 (72 per cent) failed to achieve their profit objectives. According to an article by Evans  in the Economist (June 2005) entitled 'Project management, overdue and over budget, over and over again', many firms have reported on overdue and overbudget projects. The article reflects on project inadequacies, from silo approaches to shortcomings in project phases (i.e., initiation, planning, execution, control, and closure). The article quotes the Journal of the American Planning Association, examining 210 big rail and road projects in 14 countries, and referring to poor results being attributed to inaccurate demand forecasts and the importance of project management being ignored. More recently, Shehu, Endut, Akintoye and Holt , in a study of 359 projects, also point out that 55 per cent of Malaysian projects experienced cost overruns. It is clear that projects are burdened with poor project outcomes, and that further attention is required. Even though much research has been done on project management, many projects have poor outcomes. It is therefore important to see what research has been done. Covering the full extent of project management research would be impossible; however, it is important to look at some of the research evidence in the project management body of knowledge, such as the following research on project management: Kloppenborg and Opfer  on the current state of project management; Grundy and Brown  on strategic project management; Crawford and Bryce  on project monitoring and evaluation; Kadefors  on trust in project relationships; Cheung, Wong, Fung, and Coffey. on predicting project performance; Hyväri  on project management effectiveness; Shenhar and Dvir  on the challenges and opportunities in project management; Kolltveit, Karlsen and Gronhaug  on different perspectives on project management, including leadership, task, and business perspectives; Kwak and Smith  on project risk management; Blichfeldt and Eskerod  on project portfolio management; Aubry, Muller, Hobb and Blomquist  on project management offices; Choi, Chung and Lee  on risk perception analysis; Shi  on rethinking implementation of project management; Yang, Huang and Wu  on project manager leadership styles, team work, and project success; Cao and Hoffman  on project performance evaluation systems; Davies  on stakeholders and their perceptions of project success; and Pinto  on project management governance and the normalisation of deviance. More recently, Fernandes, Ward and Araújo  give further support to improve and embed project management practices in organisations. Further research, specifically of factors affecting poor project outcomes and how to mitigate those outcomes, is given by the following researchers, among others: Baker and Fisher , identifying factors affecting project success; Atkinson  on the project management focus on cost, time, and quality; Chapman and Ward  on risk efficiency for best practice projects; Chapman  on risk and uncertainty management; Atkinson, Crawford and Ward  on fundamental uncertainties in projects and the scope of project management; Braimah and Ndekugri  on factors in delay analysis; Ahsan and Gunawan  on cost and schedule performance; Van Os, Berkel, Gilder, Dyck and Groenewegen. on project risk; and Hazir  on analytical models and decision-support tools for project monitoring and control. From the research evidence it is clear that poor project outcomes are a concern, and mitigation of poor project outcomes is needed. The following authors, among others, provide some guidance: Crawford  suggests that project management maturity models provide a path to project management excellence; Jugdev and Thomas  see project management maturity models as the silver bullets for competitive advantage; Crawford and Bryce  propose project monitoring and evaluation as a method to enhance the efficiency and effectiveness of project implementation; Jaafari  sees project and programme diagnostics as a systematic approach to project management maturity and evaluation; Mittermaier and Steyn  focus on project management maturity models; Qureshi, Warraich and Hijazi  propose project management assessment models; and Guangshe, Yuting, Xiangdong, Jianguo, Jiming, and Kewei. also support project organisational maturity. Clearly there is a need for some investigation into project management assessments (PMAs), which may be seen as the basis for project management maturity and the path to project management excellence. Notwithstanding the importance of PMAs, little empirical work has been done on them. Some empirical work has been done by the following researchers, among others: Ika, Diallo and Thuiller  on critical success factors for world bank projects; Teller and Kock  on project risk management and its influence on project portfolio success; Mir and Pinnington  on evidence linking project management performance and project success; Basu  on quality in projects; and Xu and Yeh  on a performance-based approach to project assignment and performance evaluation. Clearly further empirical work on PMAs will contribute to the project management body of knowledge. a) Null hypothesis: H0, there are no significant differences between means for PMA constructs within each industry sector. b) Alternative hypothesis: H1, there are significant differences between means for PMA constructs within each industry sector. a) Null hypothesis: H0, there are no significant differences between variances for PMA constructs within each industry sector. b) Alternative hypothesis: H1, there are significant differences between variances for PMA constructs within each industry sector. a) Null hypothesis: H0, there are no significant differences between means for the overall PMA project result within each industry sector. b) Alternative hypothesis: H1, there are significant differences between means for the overall PMA project result within each sector. This research also lays a basis for further research in using PMAs as a tool that may be used to develop project management as a capability. The research methodology is discussed next. 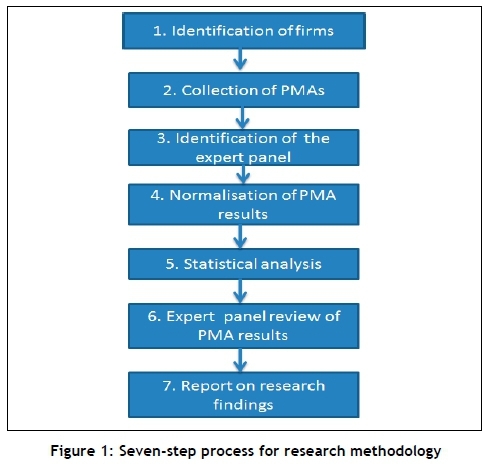 The research methodology consisted of a seven-step process, depicted in Figure 1. Each of the steps in Figure 1 is discussed next. 1. Step : Identification of firms participating in the research. The firms were chosen specifically for their willingness to participate in the research. It proved to be difficult to encourage firms to participate in this research, as the research includes an in-depth analysis of the firm's project management practices and results; and some were not willing to divulge project-specific information. However, the author was able to elicit the support of four firms to participate in the research. The four firms studied operate in the electronics and electrical engineering industry; the information and communication technology industry; the service industry; and the consulting engineering industry. The firms opted to be anonymous contributors to the research; therefore, for the purposes of this research, the firms are identified as Alpha (α), Beta (β), Gamma (γ), and Phi (Φ). The demographics of the firms are shown in Table 1. 2. Step : Collection of project management assessments (PMAs). Seventy-five PMAs were collected across four firms. The PMAs were in-house project assessments that each firm used to evaluate project management maturity. The PMAs may also been seen as an indication of the firm's project management practices. It was not the intention of this research to evaluate the PMA tools or to develop new PMAs. Rather, the scope of this research was to compare the results of the existing PMAs used by the firms. (See the section under 'Further research' to develop PMA tools.) The PMA tools across the four firms were different; therefore the PMA results had to be normalised to enable comparisons. Normalisation was done using key words and phrases, following which each of the constructs was grouped into three constructs: a) project organisation, b) risk and variation, and c) project planning, engineering design, and quality. a) Project organisation - PMBOK  defines project organisation as the human infrastructure of the project that includes the project organisation chart and the roles and relationships of the project team. For this paper, the definition is expanded to include project ownership (project manager agreement and project organisation structure), behaviour of executives (executive involvement and support), financial control (project monitoring and control), and project structure (e.g. human infrastructure). b) Risk and variation - PMBOK  defines 'risk' as the process concerned with risk management planning, identification, analysis, responses, and monitoring and control of a project. For this paper, we expand the definition to include the risk and variation that the project needed to have a proper process in place to cover risk management, change and claims management, involvement of stakeholders (customers, employees, and other stakeholders) to mitigate risk, a proper project close-out process to mitigate risks associated with project creep, and project compensation for the project team. c) Project planning, engineering design, and quality - PMBOK  defines project planning as a formal set of approved documents used to guide both project execution and project control. In this paper, project control includes project quality plans and engineering design. For this construct, the following is included: a project plan (bar or network chart, work packages, dependence analysis, etc. ), a project quality plan, and the engineering design, which includes a consulting and an innovation component. The normalisation process (step 4) was necessary, initially to set up the three constructs, and then to compare them. The three constructs consisted of 14 subscales. Grouping the subscales into each of the PMA constructs was done through the normalisation process - this was achieved by all eight executives in the expert panel agreeing to the grouping; when there was no agreement, the subscale was dropped from the analysis. The grouping of the PMA constructs and the subscales are shown in Table 2. 3. Step : Setting up the expert panel. Expert guidance in project management was required to assist with the normalisation process. Two executives from the project management area in each firm were selected. They had more than ten years' experience in project management, and held leadership positions within their firms. The experts also had to be knowledgeable about the project management practices, policies, and guidelines within their firms, and knowledgeable about project management as a discipline. 4. Step : Normalisation of the PMA results. This involved normalising the PMA results across the four firms; this was accomplished through in-depth interviews with six executives from the participating firms. The expert panel reviewed the PMA tools from the different firms and, by using key words and phrases from each of the PMAs, a common template was developed. The PMA results were then used as the input into this template, and analysed. The PMA template consisted of a five-point Likert scale, where '1' was rated as the lowest level of implementation, and '5' was rated as a world class level of implementation. 5. Step : Statistical analysis. This was performed on the normalised PMA results, using SPSS version 20.0. 6. Step : Expert panel review of the statistical analysis. The results were reviewed during two three-hour round-table discussions held with the expert panel. 7. Step : Report on research findings. The research results are discussed next. The data consisted of a sample size of 75 PMAs. After the normalisation process, a PMA template was created, resulting in three categories: a) project organisation, b) risk and variation, and c) project planning, engineering design, and quality. This consisted of 14 subscales in total. The constructs are shown in Table 2. Cronbach's alpha tests were performed for the 75 PMA results to ensure that they were correctly categorised into the three constructs. The reliability tests are shown in Table 3. The values of Cronbach's alpha for a) project organisation, b) risk and variation, and c) project planning, engineering design, and quality are 0.711, 0.735, and 0.749 respectively, all of which are greater than or equal to the recommended level of 0.70 . Others, such as Siriram and Snaddon , have used values above 0.6. In addition, item-total correlations are high, indicating that they have high internal consistency to minimise the contribution of random error. There is also very little difference if items are deleted, showing a good level of internal consistency. Reliability and validity were assessed as follows: reliability was assessed by the coefficient alphas; and the factor structure and the measurement quality were assessed by exploratory factor analysis. Tables 3 and 4 show the results for reliability and factor analysis respectively. To understand the factor structure and measurement quality, a principal component analysis with Varimax rotation was conducted, with the results shown in Table 4. To identify the number of factors to retain, an evaluation of the eigenvalues was used. Throughout this process, all items were loaded into three different factors. Three factors in which eigenvalues were greater than one (1) represent a) project organisation; b) risk and variation; and c) project planning, engineering design, and quality. Furthermore, the percentage of explained variance by the three factors is 28.86 per cent, 20.87 per cent, and 18.19 per cent respectively. And all the factor loadings are above the acceptance level of 0.50 . These results therefore indicate the uni-dimensionality of the three constructs. Because estimation methods are easily affected by the distribution variables, the descriptive statistics of the variables were also assessed. 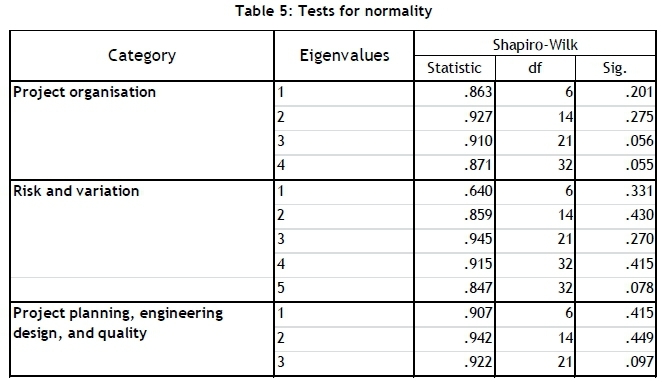 All variables were within the acceptance levels, indicating that the data is normally distributed, Table 5 (Shapiro Wilk Sig. values > 0.05). Table 6 shows the results for the three hypotheses. 1. H1: Hypothesis one: For the differences between means for the PMA constructs in all four industry sectors (electronics and electrical, information and communications technology, services, and consulting engineering) all show no significant differences between the means for the three PMA constructs - i.e. a) project organisation, b) risk and variation, and c) project planning, engineering design, and quality. Therefore, the null hypothesis is fail to reject i.e. H0: There are no significant differences between the means (P (2-tailed values < 0.05). Table 6 also shows whether the results for the PMA constructs are significant or not significant. 2. H2: Hypothesis two: For the differences in variances for the PMA constructs, ANOVA testing will be used. For ANOVA F tests for F values > F critical value, the null hypothesis is rejected. ANOVA tests were performed at a 0.05 level of significance. For the information and communication and services industries, H0 was rejected. 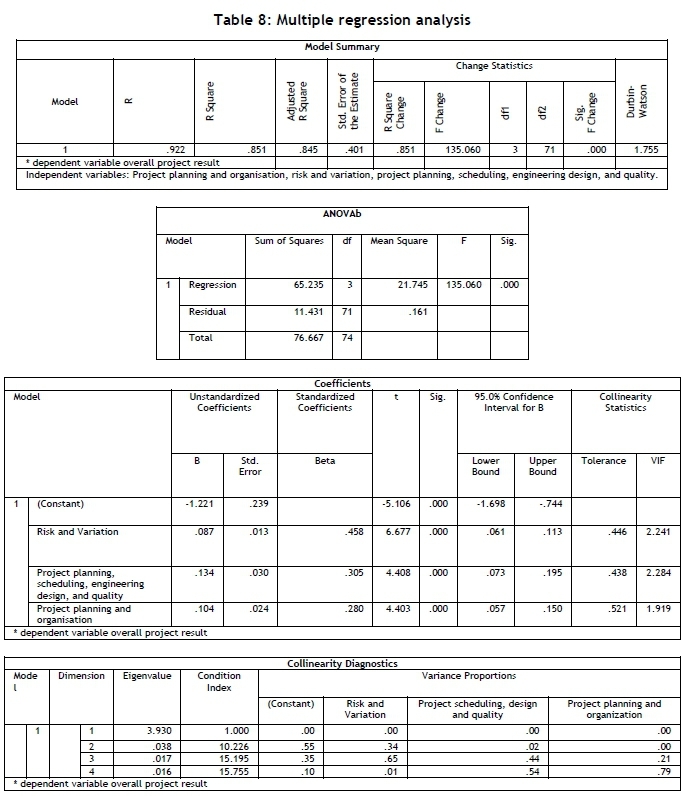 In the two other sectors (electrical and electronics, and consulting engineering), H0 varied and either failed to be rejected or was rejected; details are given in Table 6. 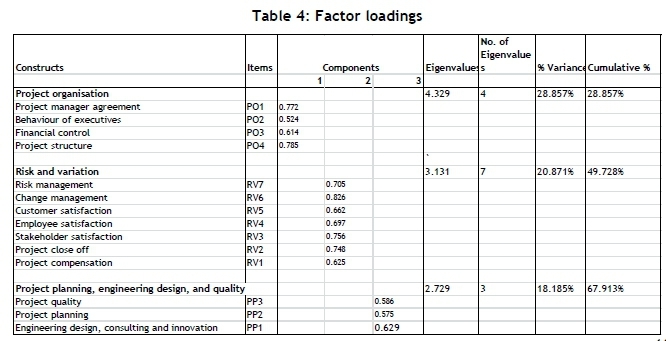 Lavene's test statistics for homogeneity of variances and the ANOVA F tests for the PMA constructs - a) project organisation, b) risk and variation, and d) project planning, engineering design, and quality - are also given in Table 6. For the Lavene's test statistics, significant values < 0.05, the null hypothesis is rejected (Lavene's significant values in the third column of Table 6 are used). 3. H3: Hypothesis three: For the differences in the overall PMA project result, the hypothesis for the electronics and electrical and the information and communications technology industries both show significant differences between the means for the projects; thus the null hypothesis is rejected i.e. H0: There are no significant differences between the means (P 2 tailed values < 0.05). In the services and consulting engineering industry, no significant differences are found between the means; thus the null hypothesis cannot be rejected (P 2 tailed values > 0.05). 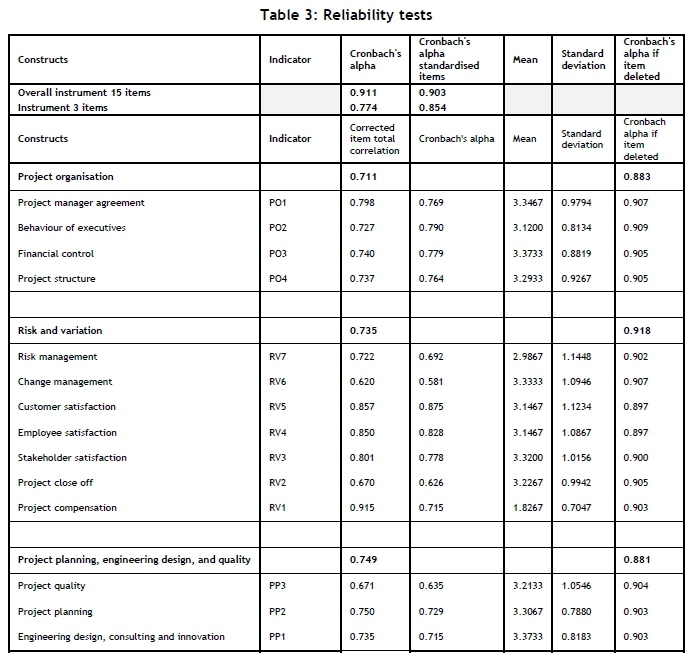 Table 6 also shows whether the results for the PMA constructs - a) project organisation, b) risk and variation, and c) project planning, engineering design, and quality - are significant or not significant. 1. H1: For the differences between the means for the PMA constructs, the expert panel felt that the fact that there were no significant differences in the results was an indication of bias in the way that the PMAs were administered, because all of the PMAs were administered by the project teams themselves. PMAs were used as a self-assessment tool. They also felt that in future the PMAs should be administered independently. However, they did comment that project management in the electronics and electrical and the consulting engineering industries was more mature in implementation, and that therefore this result was not surprising. 2. H2: For the differences in variances in the information and communication and the services industries, these were significant. Here the expert panel felt that this was because project management practices were not being well embedded in these two industries. Project management was seen more as a coordination and escalation function. Regarding the electronics and electrical engineering and the consulting engineering industries, and the possible reasons for the differences in the variances, the expert panel felt that the implementation of project management was more mature in some areas and weaker in other areas; hence the inconsistency in the results. 3. H3: For differences in the overall project result, the electronics and electrical and the information and communications technology industries show significant differences. Here the expert panel felt that, for the electrical and electronics industry, this was due to some poor projects and some good projects, since the project management was at a more mature level. For the information and communications technology industry, they felt that project management was not well embedded and was seen more as a coordination function; this finding is consistent with the H2 differences in variances. For the services and consulting industry, no significant differences were found. For the consulting engineering industry, the expert panel felt that project management was at a more mature level of implementation, and that the results were consistent with H2. Regarding the services industry, for which the expert panel felt that project management was still at a low level of maturity, there were no differences in means because of bias; this is consistent with significant differences in variances in the services industry. They also indicated that the services industry was not really functioning as a project management organisation, which is reflected in the low level of maturity. a) Project categorisation - e.g., A, B, C class projects, where A is high in complexity and involves long implementation periods (say, three years or more). B is medium levels of complexity and requires one to two years; and C is low levels of complexity and a duration of less than eight months. However, this will vary per industry sector. The important point is that some level of project categorisation exists that may be used to determine the level of PMA (A, B, or C) to be implemented. b) Involvement of executive management in high-level projects. Executives can provide leadership and guidance, especially in A and B projects. Therefore executive involvement is important. c) The handover from sales to project teams. The expert panel pointed out that a poor handover from sales teams may lead to scope creep, and is an area that needed further attention. Another point is project manager agreement: does the project manager agree that he/she can deliver this project as it was sold to the buyer? This is an important point that needs to be noted upfront. Also of importance is handover gates to other functional areas - e.g., engineering, procurement, and quality - that need to be noted in the project structure plan below. d) The project structure plan consists of at least the following: a proper project plan (e.g., bar chart, network diagram, critical path analysis) that is a realistic representation of the project; clearly separated work packages (handover points, as in c) above); clear lines of communication; and an accurate representation of the stakeholders. e) Resource planning to include a proper dependence analysis between the different work packages, allocation of the necessary resources (material, personnel, and financial) to the work packages, and definition of the project plan into sensible phases with clear delivery milestones. f) Trust in project relationships is important. Often team members are aware of risks, but - for fear of failure if they disclose the risks - they remain silent. Therefore, trust in project teams should also be measured. The involvement of the relevant stake holders, such as customer groups and the procurement and supply chain, have different perspectives; so their involvement in project activity is important, and will reduce the risk of untrustworthiness. 5. The expert panel felt that further governance and support was required to ensure that the PMA tool received the correct attention from an executive standpoint. They also felt that the implementation of the PMA should be audited by an independent body, such as quality management or internal audit. 6. The expert panel supported the view of developing an industry 'standard' for a PMA tool that can be developed and used. They felt that merely having and implementing the PMA would not be sufficient; it was more important to have the PMA with the correct constructs, leading to more beneficial implementation. Therefore, an industry 'standard' for a PMA will be advantageous. In summary, the expert panel felt that, while PMAs were implemented in firms and provided valuable insight, further detail for the diversity of PMA constructs is still required. They also felt that, if more constructs (like points 4a to f above) had been included, the results might have been different. Therefore, it is concluded from this analysis that the PMA tools being used by firms are limited and have shortcomings, and that PMA tools need to be further improved. However, PMAs are an important part of project management maturity, which needs to be further investigated. To find out whether there were any correlations between the four construct categories, a multi-correlation analysis using Pearson's correlation was conducted next. The results of the multiple regression analysis are shown in Table 8. The model is a good fit, with an R-squared value of 0.851 and an adjusted R squared valued of 0.845. ANOVA sum of squares gives the total (sum of squares) as 76.667. The F change is also quite high at 135.060. In terms of the collinearity statistics, both the tolerance values and the variance inflation factors (VIF) are low, which means a lack of collinearity. The VIF values are below the threshold value of 10 . The evidence for multicollinearity is evident in a) the principal component analysis in Table 4, which shows a better model fit; and in b) Pearson's correlation, where an indication of correlation between dependent and independent variables is shown in Figure 3. In addition, the condition indices are low, indicating a low level of collinearity. To show the links between the different PMA constructs, a correlation analysis using Pearson's correlation was also performed (see Figure 2). Pearson's correlation analysis shows that all correlations are significant at the 0.01 level of significance. The correlation diagram reflects the fact that all of the categories - a) project planning and organisation, b) risk and variation, and c) project planning, engineering design, and quality - affect the project result. Poor performance in any of the PMA constructs is likely to affect the overall project result. The research was limited to four firms across four industry sectors and 75 projects. It would be beneficial to add more firms and projects to the analysis. However, obtaining such in-depth project information is problematical because most firms are not willing to disclose such detailed information. Given the same data set, it would be beneficial to feed these results back to the firms studied, and then monitor the results in a few years' time to validate and understand any further improvements and maturity in project management practices. As PMA assessments were done at a particular time (a 'snapshot'), it would be interesting to obtain PMA assessments through the life cycle of the project and to compare the results at different phases. While the research participants included project management personnel, it would be beneficial to include other stakeholders in the research, such as product managers, marketing managers, engineering managers, and service managers. Including customer viewpoints would also be interesting. A further limitation of the research was the use of existing PMAs, as these had too few constructs - i.e., a) project planning and organisation, b) risk and variation, and c) project scheduling, engineering design, and quality. Other constructs could also be included, as suggested by the expert panel in section 4.3. This research has made a contribution to the knowledge that shows that differences in project management practices exist across different industry sectors. It would be interesting to find out why there are significant differences in the electronics and electrical engineering and the information and communication technology industries, while there are no significant differences in the service and consulting engineering industries. There is also an opportunity to develop a 'standard' PMA tool that can be used to measure project management practices across different industry sectors. The research was conducted with four firms within the electronics and electrical engineering, ICT, services, and consulting engineering industries. Opportunities exist for further research by increasing the number of projects within these industries to allow more robust statistical testing of larger and more diverse sample sizes, which may allow other statistical testing methods such as structural equation modelling (SEM). Finally, additional research could investigate the relationship between project management and operations management practices, as this was an issue raised in the services industry. A possible question to be asked is: Is the service industry more suited to a project-based or an operations-based organisation? 1. Using empirical data, 75 PMAs across four firms and four industry sectors were analysed, showing that differences and similarities exist within and between industry sectors. 2. The results were validated by an expert panel. 3. Opportunities for further research have been identified. 4. 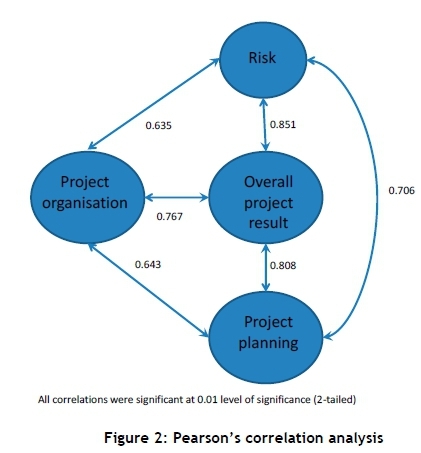 Pearson's correlation analysis was used to identify links in the PMAs and to show how the different constructs relate to the overall project result. PMA will add value to both researchers and practitioners in project management. The PMA may be used as an instrument to measure project management maturity.